What they say is really true: If there’s a niche for it, there’s probably a podcast about it. It is no less true in the world of construction. In fact, there are quite a number of them out there, as a quick glance at the iTunes store will tell you. The thing about podcasts, though, is that everyone seems to have one and some are just better quality than others. Some are out there simply to showcase a specific company or brand, and are geared more toward marketing than informing. 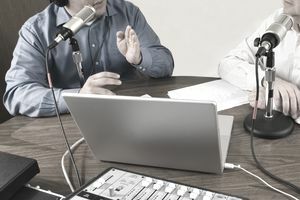 Podcasting is a great way to keep people within the construction industry informed about current trends, changes in laws, and procedures, as well as providing valuable information on landing better contracts and keeping your organization running lean and mean even when work is slow, or the economy takes a plunge. To save you the trouble of having to weed out the good from the bad, we have five podcast recommendations that span a considerable spectrum within the construction industry. From specific niche categories to marketing (and by marketing, we mean developing marketing strategies, not raw advertising), we think that you’ll find something here that is of considerable value to you and your business. We recommend checking out at least one episode of each and settling on the one(s) you ​think provide the most continual benefit. The list goes on from there. Construction Industry Podcast also features a steady stream of guests, all of whom are experts in their fields, also spanning a broad spectrum within the industry, from labor to management to legal and accounting. If you have any questions you need to be answered right away, chances are there is already an episode on the subject. Just go to iTunes and plug in the name of the podcast or just “Cesar Abeid.” You can also visit the podcast’s official page on Stitcher.com to browse and listen. This one isn’t updated as frequently as CIP, but it does zero in on one very popular and under-served niche: modular building. A look at the podcast’s official website’s podcast page reveals an impressive listing of episodes by title and theme. This particular show has the added benefit of being produced in both audio and video formats, so if you are a more visual person, you can put faces with the voices. You also have the benefit of being able to download the files directly from the website without a subscription, and all current and past episodes are free. This podcast also provides the benefit of direct downloading without a subscription, and all the content back to Episode 1 is available and free to download through iTunes. As you can see, there is a lot of great content out there, and an impressive diversity of it as well. We think that with the above list, you’re sure to find some great information and well-produced content that you can use to help shape and mold your own company into one that is leaner, more profitable, and more cutting edge. Add to it the benefit of Capterra’s wide selection of quality construction management software, and you have a one-two combination that can help you break out way ahead of even your toughest competition.